Bass Guitar Player based out of the Merritt Island, Florida. Patrick is an upcomming renowned and respected bassist, whose style not only reflects his technical gift but also his distinct musical sensibility. Whether it is different types of music Patrick applies the same precision and intensity to his bass playing, which is never lacking in emotionand feel. His timing, sense of rhythm and sheer inventiveness have given him a unique style and sound, which is instantly recognisable, yet compatible with the many different styles of music. For Patrick, attention to the music, consistency and dedication are key. As a performming bassist, it is this, along with his easy-going attitude, ability and skill, that have continued to earn him to play with other top musicians. Over the last year versatility has become a strong attribute in his playing. Patrick has been involved in a range of musical genres that include Motown, rock, and progressive. Aside from bass guitar Partrick plays Drums, keyboards, guitar, and Sax. Playing other instruments and having experience with producing, engineering, and arranging music continues to create new sounds in his origanl music. 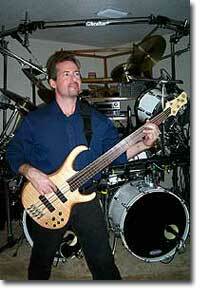 But more importantly, it has become a contributing factor to how he approaches bass playing techniques. Patrick's musicianship as a bassist was influenced by no specific individual element in the music world. Instead, his style has been shaped by legends such as Red Hot Chili Pepers, Commodores, Cream, Victor Wooten, and the Police. 2013 - 2015 : COVER STORY, performing rock dance music. 2012 - 2013 : JUSTUS, performing rock dance music. 2011 - 2012 : DARK HOUSE, performing orignal blues rock. 2007 - 2010 : VOICES IN YOUR HEAD, performing orignal and classic rock. 2006 - 2007 : PARKAVENUE, performing motown music. 2005 - 2006 : AFFLECTION, performing classic rock and metal.